Zweimal waren meine Frau und ich, teilweise mit Bekannten, auf Trekking-Touren in Nepal. Beide Male hatten wir den gleichen Guide namens Gyan karki. Jedes Mal waren wir sehr zufrieden. Auf eine Einladung unsrerseits hin hat Gyan karki im Sommer 2001 etwas mehr als drei Monate in der Schweiz verbracht. Wir können somit sagen, dass wir ihn sehr gut kennen. Er ist sehr zuverlässig, sauber und charakterlich einwandfrei. Gyan spricht englisch undebenso gut deutsch. Vor kurzem hat Gyan karki mit einem Partner zusammen seine eigene Trekking Agentur eröffnet. "Business is low" in Nepal, wie wir alle wissen und so hat uns Gyan gebeten, einige Agenturen in der Schweiz anzuschreiben, welche ihm eventuell zusätzliche Arbeit vermitteln könnten. Es würde uns freuen, wenn Sie in irgend einer Form die Dienste von Gyan karki in Anspruch nehmen könnten und sind überzeugt, dass Ihnen mit Gyan karki in Nepal ein guter und zuverlässiger Partner zur Verfügung stehen würde. Für allfällige weitere Auskünfte stehen wir jederzeit gerne zur Verfügung. Adventure Treks Nepal (P). 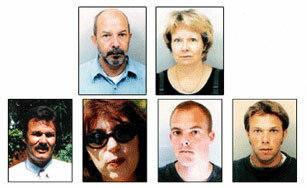 Ltd.
Susan, Ernest, Oliver, Alex, Roby & Ursy. Jomsom Muktinath + Annapurna Base camp with Chitwen National Park. 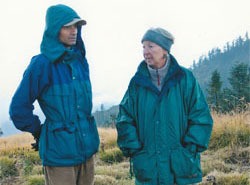 Our initial contact via e-mail from Canada with Nepalese Guide / Tour agent Gyan karki (Adventure Treks Nepal (P). 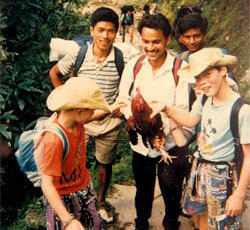 Ltd.) was the most important decision of our trekking trip to Nepal. Consulting with the 4 of us (a couple of 60 years old skiing friends). He suggested routes and schedules and promised reliable porters and choice of nice guest houses to make out journey a worry, free one After meeting us at the Kathmandu Airport he led us on 3 weeks of trekking that included going up to Annapurna Base Camp then west to the kali Gandaki River valley and way to Tibet. On the trek his knowledge of the areas and language meant we always had comfortable lodging each night with excellent meals along the way. It was a trip of a life time ! We were able to concentrate on the magnificent scenery and the people, knowing all the trekking details were being handled expertly by Gyan He made it all possible and we sincerely thank him. Adventure Treks Nepal (P). 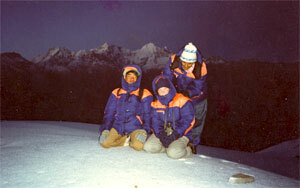 Ltd., with expert guide Gyan karki, arranges all details for trekking in the Himalayas. Various routes with lodging at guest houses or in tents and porters to carry trekkers' belongings are all offered by Gyan who knows the areas and culture, languages etc very well. 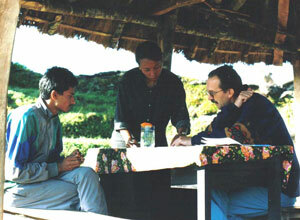 Flexible schedules along the way are possible as the trek is always personalized to suit the clients. 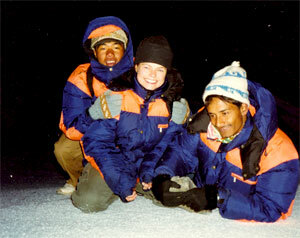 With Adventure Treks Nepal (P). Ltd. the trekking experience will be a trip of a lifetime ! ® Arrangement of all details for trekking. ® Routes, lodging, porters offered by Gyan or Guides. ® Trek personalized to suit the clients. ® A trip of a life time !!!. Larry Hall & Barbara Hall. Annapurna Base Camp + Jomsom Trek. Prior to my arrival to Nepal, I had been in contact with several tour agencies trying to figure out which one would best suit my needs. I was first introduced to Gyan karki and Adventure Treks Nepal (P). Ltd. by my travel companion who mentioned to me, "This guide sounds helpful and reliable, and the trek sounds great!" My trip to Nepal turned out to be one of the most memorable experiences I have ever had, and I couldn't have done it without Gyan and his team. Trekking through the Himalayas felt like going through a "Fairy Tale Kingdom" and Gyan and His Company gave the full royal treatment. His expertise of the hills and his knowledge of every corner of those mountains made me feel safe and secure during the entire trek. Since then, I have recommended Adventure Treks Nepal (P). Ltd. to anyone I meet who has an interest in visiting the area. I definitely plan a return trip to this "Fairy Tale Kingdom" and Gyan will be my first point of contact to arrange the excursion. I am guaranteed that my travel plans will be handled by a true expert and professional. 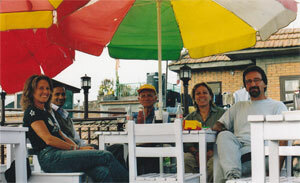 Gyan is not only a "Travel, Trekking guide" along your travels through Nepal, but he is also a "friend" you can trust. Rochelle A. Santiago & Omar Samra. It was wonderful time in the mountain with Gyan. Excellent Trekking crews and the food. 05. It was a super trip. It was a great pleasure to do this trip in the Nepal Himalaya. All was perfect and really appreciate the quality of the Services. I recommended this team and the company to Everybody. I will remember these days for ever ! 07. Die Leitung und the fuehrung war Prima. 08. Die Trekking war sehr schoen. Die hodoes gut, das Essen immer sehr gut, Fuehrer was immer sehr freundlich bei uns. 09. Die Leitung und the fuehrung war Prima. 10. Sehr gutter Trekking / Tour leiter Kann ihn empfehlen ! 11. Very agreeable trip with you. We will recommend you to other People. Visit us when you are in Switzerland ( Tel. First). We will speak high – german with you. 12. Trekking was more work than antieipated but what a sense of accomplishment at the end of the day. I will bring home many great memories of our experience Trekking in Nepal with AH Adventure Treks and look forward to my next trip! 13. When I decided to come to Nepal, I really didn't know what to expect. I was very happy with what I found. This country is beautiful, the peoples Are great, the trek was very exciting. My whole experience has been wonderful. Thanks for everything. All your help + Guidance on the trek, Chitwen, in the city and getting out of the city has been much appreciated. 14. Thank you for making our Trekking Experience as well as Nepal trip. So wonderful with your Good Planning & Experience. 15. This trip was one of my top ten best experience Of my life with Adventure Treks. Well planned, Challenging at times, rewarding views, Educational & much more. 16. We went Trekking in Ganesh Himal, And had a great trip with this company. The Trekking team was very friendly. We enjoyed very much ! Thank you for wonderful trip. Hope to see you again sometimes in the future. It has been a very good trip though I got a sick a couple of days. You have been a very good Guide, Always ready to give me a helping hand when it was necessary. So I would like to recommend this trekking company and the trekking crew for everybody. I think this trek has been very exiting, even though it has been so cloudy. For me the most important thing is that people are happy all the time, like you said the evening before we left kathmandu. I also the crew has been perfect. Always smiling and paying attention to us, so they company has been just perfect. Thank you for an excellent trek to Nepal Himalaya. I have enjoyed it very much and I hope to get time to come back to Nepal. The trek was good organized and the crews are perfect. I wish you good luck in the future. 21. In every way it has been an excellent trek! The Guide been a brilliant telling about places, peoples and so on, and the crews were excellent. Thank you so much for a wonderful trek. I have found everything perfect. All it is a brilliant organizer. I wish you all the luck and happiness in the future. Thanks for the great trek, everything has been excellent and really interesting walking through the small village. Everything is there but of course there are no problem. Anders Midtgard og maj Andersen. Thanks a lot for a very good trek, with perfect weather and the perfect crew with excellent service. Dhannyabad for derai ramro trek chha. It was a wonderful opportunity for us to discover Nepal. The country and the people. 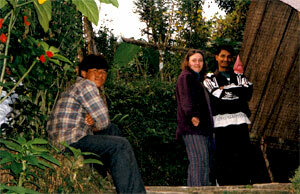 I had a great time with you in the Nepal Himalaya. Ofcourse the services and the trekking crews ! 26. It was a great trip and excellent food. 27. Thanks for a great experience here in the mountains of Nepal. I wish you all the best in the future and don't forget : Be happy…! 28. I really want to thank you for those 08 days wonderful trekking days. 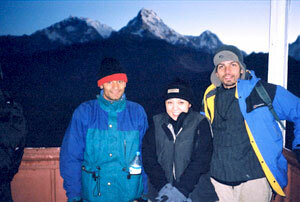 I will never forget I went trekking in Nepal, esp. not with you as Guide. Thank you for supporting us when we felt tried, telling us so many interesting things, being happy all the times. Saving me for some of the ugly spiders … hahahah… ! After those 08 days our trekking / tour is over. It has been a fantastic trip. Specially of you and your crew were very professinal so every thing was perfect. Hope to see you again one day take care and good luck. (Gokyo Valley Sep 2004 from Italy). Sono oramai due anni che trascorriamo le nostre vacanze effettuando trekking in Nepal; abbiamo usufruito dei servizi dell'agenzia Adventure Treks Nepal (P). Ltd. con piena soddisfazione di tutti i partecipanti; non solo gli itinerari, i lodges, i portatori, sono stati di alto livello, ma soprattutto fra la nostra guida, Bhuwan (che tra l'altro sta continuando a studiare italiano e puo essere quindi molto utile a chi non padroneggia la lingua inglese) e l'organizzatore Gyan Karki, si e instaurato un rapporto direi di amicizia. L'attenzione alle necessita di ogni singolo partecipante (il primo anno ha partecipato con il nostro piccolo gruppo un amico di 72 anni!!) e sempre stata ammirevole; l'organizzazione, dall'arrivo in aeroporto alla partenza, comprese le visite alla splendida vallata di Kathmandu, perfetta. Il Nepal, per chi come noi ama le montagne, e un Paese meraviglioso e merita ben piu di un viaggio; la Adventure Treks Nepal (P). Ltd.. ci fa desiderare ogni volta di ritornare a scoprire altri itinerari. E infatti nell'ottobre del 2005 abbiamo gia organizzato quello che e forse uno dei piu bei trek del Nepal, il grande circuito dell'Annapurna. Siamo certi che anche questa volta sara tutto organizzato alla perfezione. Lavoro da tanti anni nel settore turistico e assicuro che raramente un corrispondente non si presta a critiche: ma in questo caso non posso che ringraziare tutti i componenti dell'Adventure Treks Nepal per la loro professionalita, che si trasforma nella completa soddisfazione dei partecipanti. E' con molto piacere quindi che mando questa lettera e resto a disposizione di chiunque mi voglia contattare per condividere questa meravigliosa esperienza nepalese.